DECO Paint & Design, LLC serves clients in Short Hills, Millburn, Summit and the surrounding areas as a residential painting company. Over the last ten years our team has mastered the art of interior and exterior painting, wallpaper removal and installation, and much more. Take a moment to read a brief description of our services below and then contact us at 908.451.5621 with any questions or to set up a no cost in-home consultation today. Tired of the color on your walls? Read about the newest, hottest colors but are afraid to put them in your home? 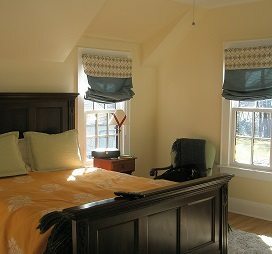 Let Deco Paint & Design and their team of professionals help create an environment you’re always happy to come home to. Whether it’s one room or a whole house, our team of professionals will take the time to repair surfaces and apply premium products to breathe new life into your home. The dictionary says Curb Appeal is the visual attractiveness of a house as seen from the street. Deco Paint & Designs team of painting professionals can give your house curb appeal by powerwashing, sanding and scraping your homes exterior. We will repair or replace any rotted wood. Lastly we will apply the neccessary coatings to ensure your homes exterior will withstand the weather while maintaining its new colorful look. Unsure of a color scheme? Don’t hesitate to ask us to help you choose an exterior color scheme that makes your home the stand out of the neighborhood. Everything in the room looks great except for that dated looking wallpaper. Of course it was “in” when it was originally installed but times have changed and the choices for wallpaper today are astonishing. Key to any successful new installation is the proper prep of the walls. Deco Paint & Design has removed thousands of yards of wallpaper. We know how to take it down and get the walls in the condition to make the installation of new wallpaper, or the painting of the walls, a perfect success! We have teamed with installers with over 30 years of experience and have installed every type of paper imaginable! You love your home. Colors look great, no damaged walls or ceilings. It just needs a little something extra. How about crown moulding? Chair rail? 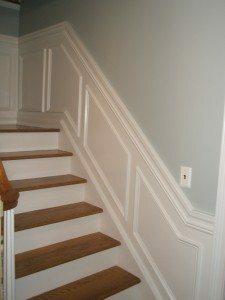 Wainscoting, applied mouldings, new doors and casings….these are just some of the architectural elements that can give any room that wow factor. Deco Paint & Design works with the finest carpenters in the business. Their attention to detail and level of craftsmanship is key to the success we have had in providing our customers another solution to creating that perfect home environment. If you have been searching for a residential painting company we urge you to contact us. Our professional team is ready to answer any questions you may have or even set up a complimentary consultation today.